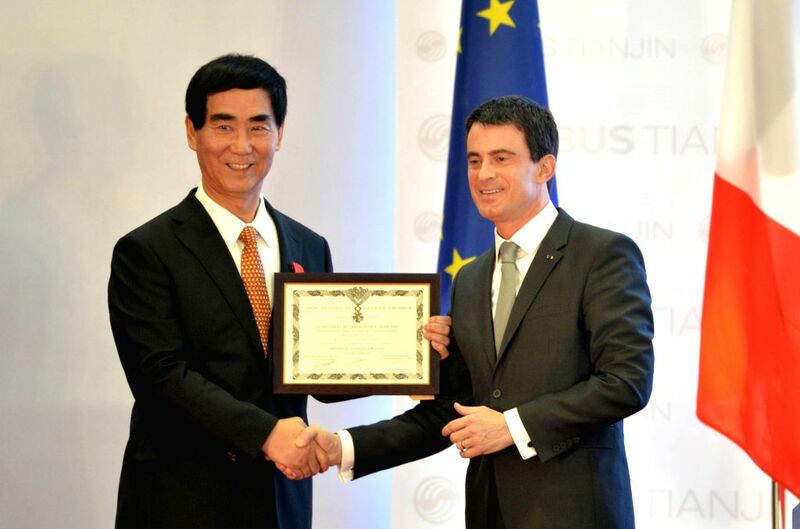 TIANJIN, Jan. 29, 2015 - French Prime Minister Manuel Valls (R) presents the Chevalier de la Legion d'Honneur to Mr. Lan Xinguo, former Chairman of Sichuan Airlines, in Tianjin, north China, Jan. 29, 2015. Manuel Valls visited the Airbus A320 Family Final Assembly Line China (FALC) and took part in related cooperation activities in Tianjin on Thursday. At the invitation of Chinese Premier Li Keqiang, French Prime Minister Manuel Valls will pay an official visit to China from Jan. 29 to 31.